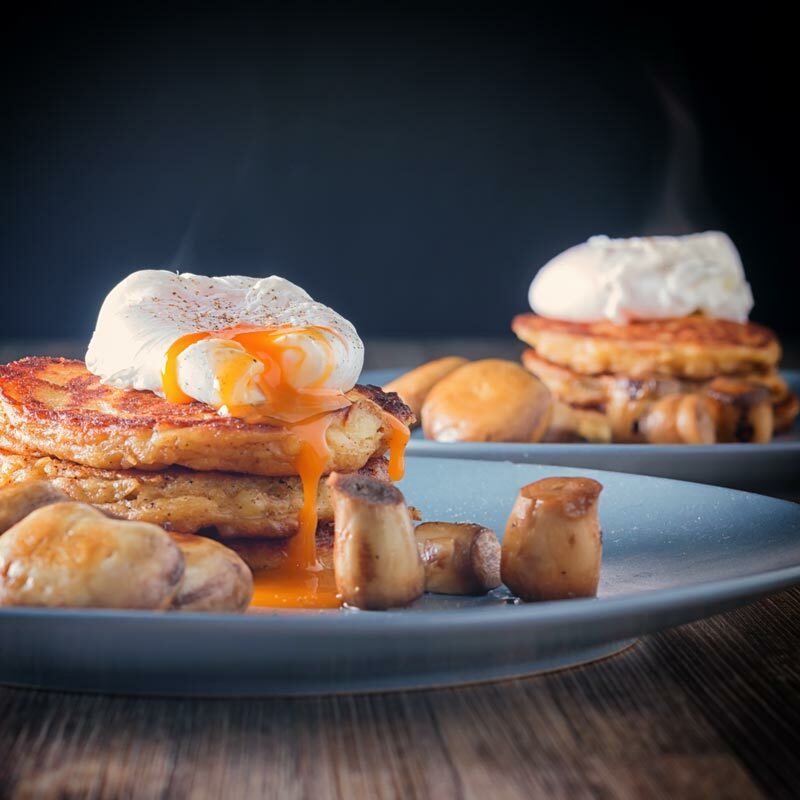 Boxty are an Irish potato pancake a super indulgent breakfast and if required an outsanding hangover cure! 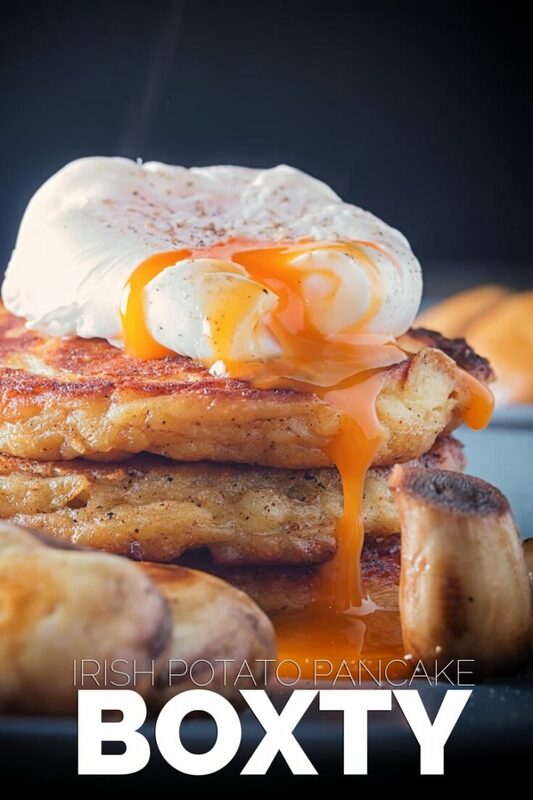 Irish Boxty… The Perfect Hangover Cure? My Boxty or Irish potato pancake recipe shares its origins, with me at least, with my beef stew recipe, my student days. This delight was something cooked up by an Irish guy I shared digs with. I’m ashamed to say I cannot remember his name. He swore it was the perfect hangover recovery recipe and we lived off it far more often than should have been allowed. Over the years I have kicked around with playing with this recipe. My mate would always say that his ‘Ma’ would make Boxty with leftover mashed potato. But as students, we never had any of that to hand. So essentially we would grate a potato, make a pretty standard pancake ‘ish’ batter throw in the spuds and off we go. In fact, on more than one occasion we would even add Guinness to the mix. How I survived my student days I have no idea! Well, my Boxty recipe now is a little more grown up but only just. And just as my student days I never have any leftover mashed potato so have to make up a little batch the night before. Your choice of potatoes is very important when cooking Irish Boxty. Just like cooking perfect chips or mashed potatoes you want a good floury potato. There was once a time that potatoes would have been sold by variety. But gone are the days of being able to pick up a good Maris Piper or King Edwards. The good news is that you can tell whether a potato is floury. Cut it open and rub it on a glass, as it dries a floury potato will leave a floury residue. This residue is starch and means a perfect boxty recipe! How To Cook The Perfect Poached Egg. The internet is full of hints and tips for the perfect poached egg. Most of them miss out the real answer, probably because it is very difficult to ascertain. The fresher your egg the easier it is to poach, it is as simple as that. 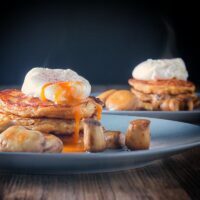 Our eggs are from our chickens and are usually 1-2 day old at most and result in a perfect poached egg every time no matter how they are cooked. When you crack an egg you will notice that the white has two distinct textures. As an egg ages the thicker part of the white breaks down. This is what makes poaching an older egg more difficult. That does not help those of you without chickens in the garden, which I am sure is most of you. Keep your water still and steady: If your water is rapidly boiling it will break up the egg. Gently place the egg in the water: Crack the egg into a bowl or saucer first and gently add to the water. Swirl the water: Creating a ‘whirlpool’ effect can help bring in the quite of the egg if it is quite old. Vinegar and Salt: I see this hint every time and have tried it and it makes no difference whatsoever so I would skip this one. Then it is a case of cooking, I favour a cooking time of 2-3 minutes. Then remove from the heat and allow to sit in the hot water for 6-7 minutes. 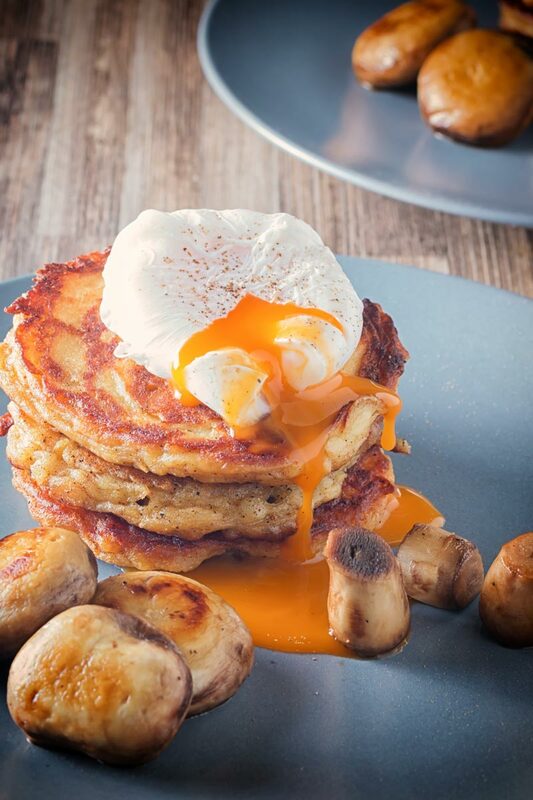 I was introduced to these Irish Potato Pancakes when I was a student at University... I swear they remain the worlds finest hangover cure! Slowly add in the milk until a spoonable batter is formed. Add about 50g of butter to a pan and take it to buerre noisette or brown butter stage over a medium heat. Add a heaped table spoon full of the batter to the butter to form the pancakes and cook on one side for 3-4 minutes and then flip and cook the second side for 2-3 minutes. I like to serve it with a poached egg and some mushrooms, but go to town add bacon and baked beans too if you wish. Oh I have not see good Boxty potato pancakes in years. Use to eat them on ever trip I went to London… Never made them myself, Saving this to try soon. Your images are gorgeous. Your photography is always so stunning, but this is something else! Just wow! I’m literally drooling over that yolk. Oh wow! I’ve never made these before but I’ve heard that they’re amazing so I’ll have to give your recipe a go! 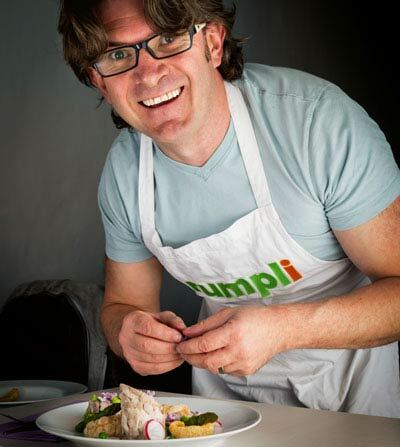 I think student days were a time of creating great food, without even realising we were doing it. Some of the concoctions that were made up on the spot were something that should never have been tasty, but somehow they were. 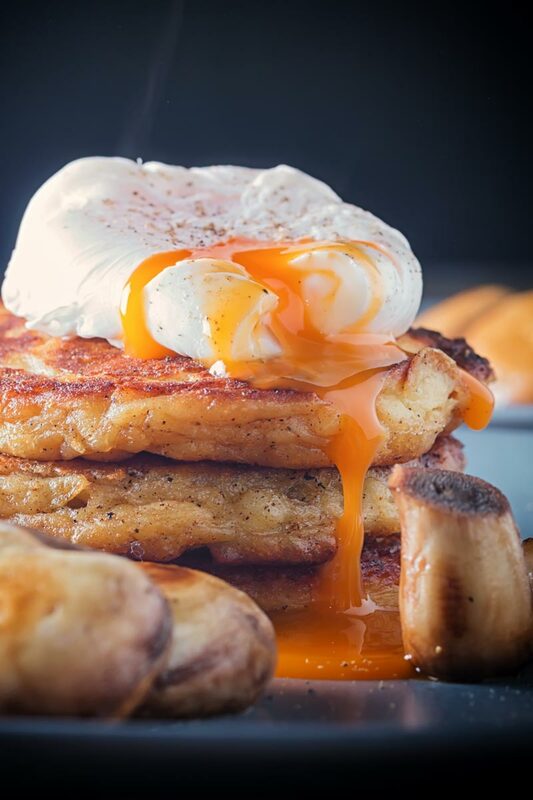 Your more grown up version looks utterly delicious, and the perfect kind of breakfast for those mornings when you just need it, like you say, the morning after the night before. Leftover mashed potatoes… As mythological as leftover wine. I will make extra and hide them from my family and myself. OHMYGODTHATEGGGGGGGGG!!!!!! Seriously though. I am all over this little potato shindig. My Irish roots are craving this dish right now. You’ve blown it up with the addition of the egg. YUM! I have to admit that a big bowl of roasted potatoes with a runny egg on top is my go-to hangover food. Though it hasn’t been needed in quite a while… I still swear by it. This looks perfect for the next time that happens. Or maybe just this weekend when my mom’s in town? I love the idea of savory breakfast pancakes. And these doused in some real maple syrup would taste divine! HA! 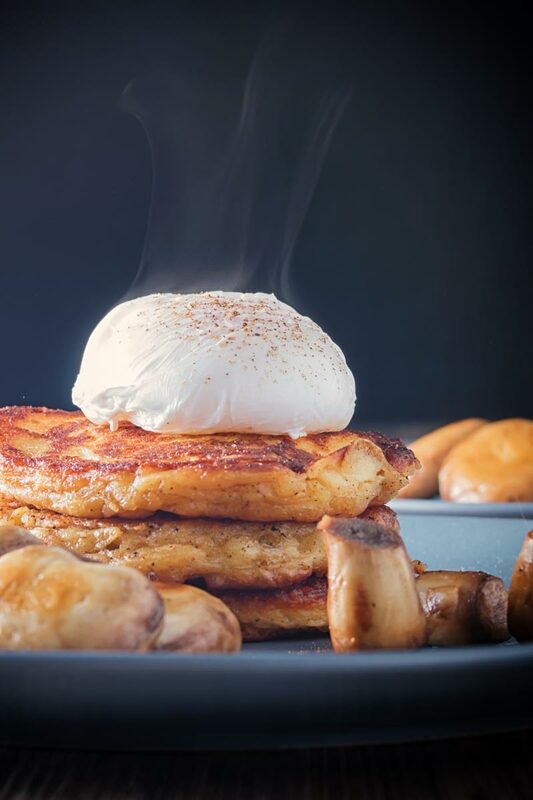 I’m always in search of a good hangover cure — and I love potatoes and pancakes! Gotta try!! Can I just tell you how delicious this looks?? My husband would absolutely adore this dish (and he might even ask me to add a piece of sirloin to it too, ha!) And your poached egg is beautiful! This. Looks. Awesome. Oh my word! I’m definitely making it this weekend for brunch!! Thanks for sharing! You have put 2 of my favourite things together in one dish. yes please….. Such a creative way to incorporate Irish potatoes. I bet these pancakes are very filling?